For whatever reason, the Blog page is chomping up a bunch of entries, displaying the start of one, then the end of one from weeks ago. 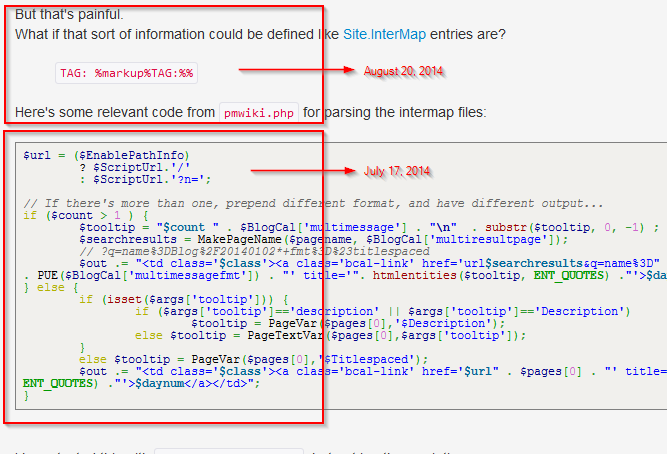 It's the Cookbook:SourceBlock extension -- when using the (:sourceend:) markup. When the trouble-spots were changed to use the [@...@] preformatted markup all was well. UPDATE 2015.03.11: I could be that the problem lay with mixed (:sourceend:) and [@...@] markups on the Blog page. Those two markups don't play well with each other when in the same page. A page-aggregator combining two otherwise-singular uses would run into that problem. The best method of accomplishing this is probably via a wiki-farm, which I haven't done yet. In the meantime, I'm expanding the scope of some of these entries. http://csharp-source.net/open-source/wiki-engines - there are more than I knew of.